A 10-minute drive to Chatujak weekend market, Sky dome resotel offers free Wi-Fi throughout the property. Free public parking is available on site. Central Ladprao Department store is a 10-minute ride away. 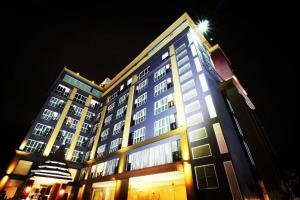 The hotel is a 30-minute drive from Donmueang International Airport. For convenience, the hotel provides a lift and on-site restaurant. Guests can sample a variety of Thai dishes at the hotel restaurant. Air-conditioned room is fitted with a flat-screen TV, fridge and minibar. Shower facilities are included in an en suite bathroom. Rate: THB 1417.50 ... THB 1750.00; select dates below to get current rates. This double room features a minibar, seating area and bathrobe. 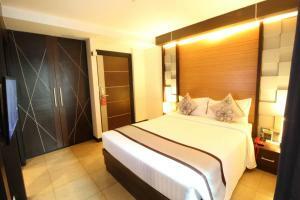 This double room has a minibar, seating area and air conditioning. This suite features a bathrobe, dining area and air conditioning. This suite features a dining area, air conditioning and bathrobe.